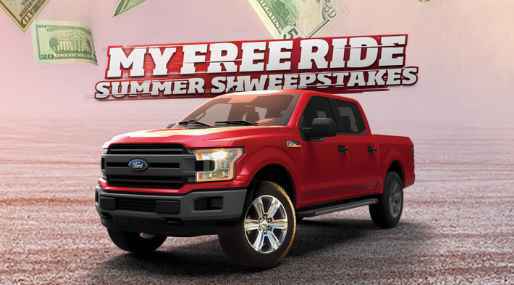 Enter the Sheetz My Free Ride Summer Sweepstakes right now at sheetz.com/myfreeride where you could win one of the three Ford Vehicles or $50,000 cash in the upcoming 3 months. How To Enter The Sheetz Sweepstakes? Prize: Three (3) Grand Prizes and ten (10) First Prizes are available to be awarded: maximum total prize pool ARV: $180,485. Grand Prizes consist of: June/Mountain Dew: Choice of one (1) 2018 Ford F-150 XLT 4×4 SuperCrew Cab (ARV: $51,890), or $50,000 cash. July/Gold Peak: Choice of one (1) 2018 Ford Explorer Limited 4dr 4×4 (ARV: $51,030), or $50,000 cash. August/Monster Energy: Choice of one (1) 2018 Ford Mustang GT Premium 2dr Convertible (ARV: $52,565), or $50,000 cash. When To Enter: The Sheetz Summer Sweepstakes starts on June 1, 2018 at 12:00:00 AM Eastern Time (“ET“) and ends on August 31, 2018 at 11:59:59 PM ET. Who’s Sponsor: The My Free Ride Summer Sweepstakes Sheetz Inc., 5700 Sixth Avenue, Altoona, PA 16602.